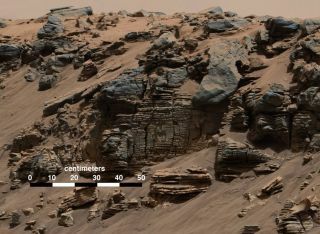 NASA's Curiosity rover identified weathered rock similar to those found in deltas where river sediment settled onto the lake floor. If the lakes lasted long enough, they could have housed microbial life in the early days of Mars. "When lifeexploded at the surface of the Earth, then everything went south for Mars," Cabrol said. Licancabur Lake lies at the top of the Andes Mountains, where the low oxygen, thin altitude and high ultraviolet radiation create conditions similar to those found on ancient Mars. The red color of Aguas Calientes comes from algae, which must create their protection from the harsh ultraviolet radiation coming from the sun. "When all the water is gone from the surface, microbes have only one solution left — they go underground," Cabrol said. This illustration depicts a lake of water partially filling Mars' Gale Crater, collecting runoff from melting snow on the northern rim. If they lasted long enough, such lakes could have served as refuge for microbial life on Mars. This story was provided by Astrobiology Magazine, a web-based publication sponsored by the NASA astrobiology program. Follow Space.com on Twitter, Facebook and Google+.